To be intoxicated with a love of life, the earth and all sentient beings is to be motivated by this love to act valiantly and courageously on behalf of those threatened, abused and without a voice. When we act on behalf of what we madly and passionately love, gladly accepting the consequences of those actions, something shifts inside. The same Power that burst forth the galaxies in all their splendor, rushes in to support our efforts. Life then becomes a profound and joyful adventure of living Love in action. But not without pain. It is a deep agony to be awake and aware of suffering. The solution is to grow a big heart with a huge vision that can see magnificence reflected even in the tiniest ant. Kristal Parks, M.A. 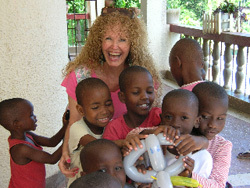 is a children’s entertainer, activist, speaker, author and elephant conservationist.